Potentiometers are variable resistors, often refered to simply as "pots" or less commonly as "rheostats". Like resistors, they come in a wide array of sizes and styles. Smaller size potentiometers will be round with three solder terminals on it. The most common application of a pot is the volume control on a radio or television. The inside of a low power pot is typically a band of conductive material. The material is connected to the outside terminals of the pot. A "wiper" or "sweeper" makes contact with the conductive material, which is connected to the middle terminal. The specified resistance of a pot indicates the resistance measured across the outside terminals (with nothing else connected). Depending on how the pot is designed in a circuit, it can be used to adjust a voltage signal or control current. Consider the need to control the brightness of a battery operated light bulb. This can be accomplished using a pot to control the voltage to the bulb or the current to the bulb. When controlling the voltage to the bulb, the voltage source is connected accross the outside terminals of the pot. The bulb is connected to the wiper and one of the outside terminals. As the wiper position is adjusted, the voltage being applied across the filament of the light bulb changes. When controlling the current to the bulb, the current source is connected to one of the outside terminals. The bulb is connected to the wiper and completes the circuit back to the current source. As the wiper position is adjusted, the current allowed to pass through the filament of the light bulb changes. Pots can also be designed to have different amounts of change in resistance when the wiper is rotated. The most common types of pots have a "linear" adjustment. 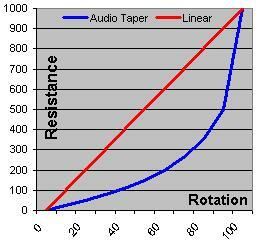 Another type of adjustment is an "audio taper", which is commonly used in audio circuits. A linear pot will change the value between the wiper and one of the outside terminals evenly. Using a 1000 ohm pot, for example, the resistance measured at the wiper will be 100 ohms when the wiper is at 10% of its rotation, 200 ohms at 20%, 300 ohms at 30%, and so on. A pot with an audio taper will change differently. A 1000 ohm pot with an audio taper may measure 23 ohms at 10% of its rotation, 48 ohms at 20%, 77 ohms at 30%, and so on. The diagram at right illustrates how the resistance may change for a linear pot and a pot with an audio taper. Audio taper was developed because the human ear does not respond linearly to loudness. It responds to the logarithm of loudness. That means that for a sound to seem twice as loud, it has to be almost ten times the actual change in air pressure. For us to have a control pot that seems to make a linear change in loudness per unit of rotation, the control must compensate for the human ear's oddity and supply ever-increasing amounts of signal per unit rotation.